The IPAF 2019 safety campaign has been created to address the increase in accidents while operating a MEWP alongside or on roadways. This trend has been identified through IPAF's accident reporting project, and is a significant cause of work at height accidents in Europe. The IPAF stand is 711 in C4 hall of the exhibition site and will offer a chance for delegates to review the updated IPAF MEWPs for Managers course, which is available for the first time as eLearning. As was the case with many of IPAF's event appearances throughout 2018, the stand will feature a sophisticated MEWP simulator to help showcase some of the recommendations of the recently published IPAF eXtended Reality (XR) Strategy document. Based on real-world incidents the campaign will emphasize the effectiveness of planning and traffic management to reduce the danger of operating near pedestrians and vehicle traffic. 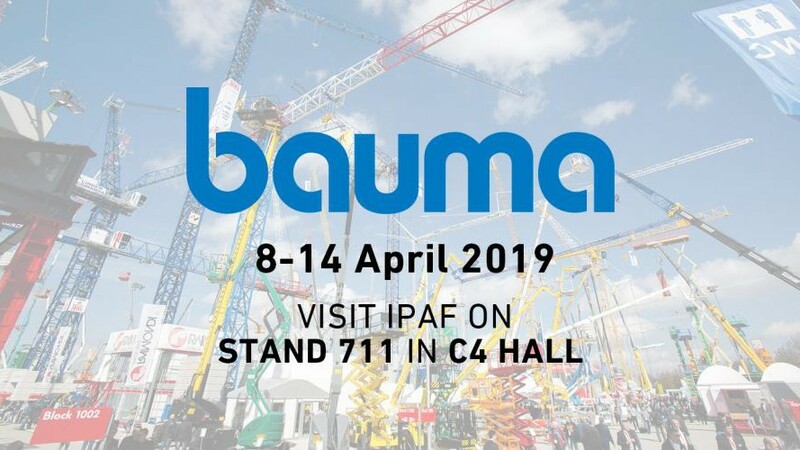 Tim Whiteman, CEO & MD of IPAF, comments: "The eyes of the world will be on bauma, with upwards of half-a-million visitors expected across the week-long event, so it's a truly unique opportunity for IPAF to showcase the latest advances in its training program and its safety and technical guidance. "It's exciting that once again we will be able to utilize the latest technology developed by one of our member firms to showcase the awesome power of MEWP simulators in enhancing training, and to share the latest important IPAF publications including IPAF-Journal in German and the U.K.'s IPAF Powered Access magazine. "Visitors to the IPAF stand will also learn about the latest global safety campaign based on IPAF's most recent accident analysis. Beyond the campaign IPAF always aims to help managers plan for and supervise work at height, and for operators to use MEWPs safely and effectively. "IPAF's safety and technical guidance is available in many languages and our staff are available to help with any queries. The evidence is clear that working at height is significantly safer when using a MEWP."